I felt very privilged to be asked for a third year in a row to donate paintings to the H.O.P.E organization’s annual fundraiser. This year H.O.P.E. is focusing on human trafficaing, with all funds raised going towards establishing an alternative income source for the women of the remote village of Kamoda. 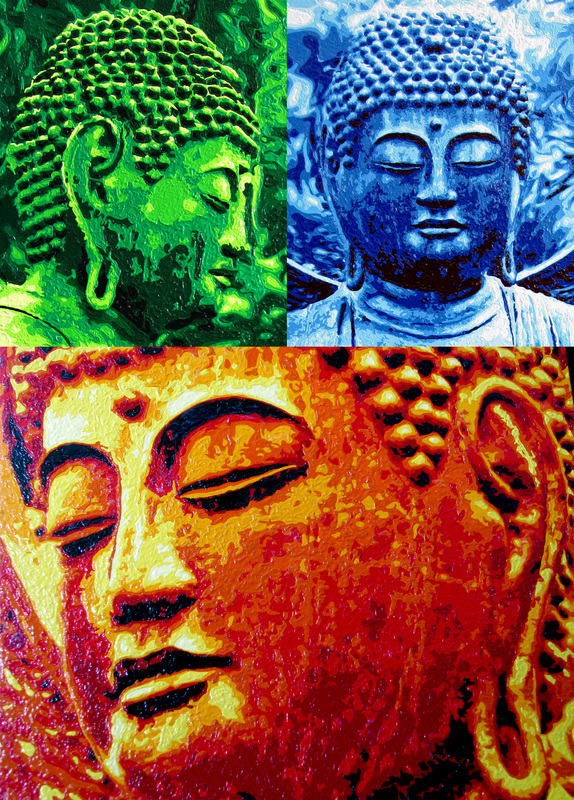 These 3 Buddhas are but another take on the large bronze Buddha I met and conversed with in the Japanese gardens in San Francisco in 2007. 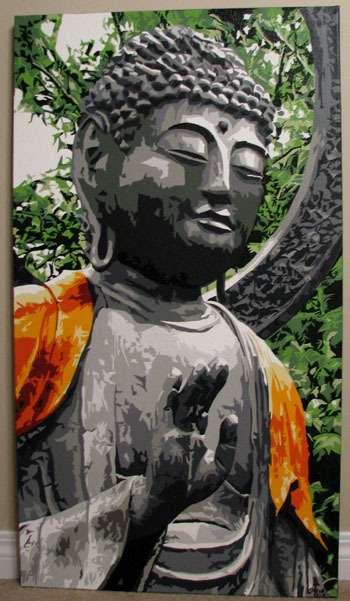 I have used the inspiration I received from the encounter with this bronze Buddha in several other paintings as well, but they have really evolved along the years as I experiment (and grow more confident) in different mediums. Due to my ongoing battle with arthitus and chronic tendonitus in my left hand, I decided (errr… was forced) to change my tactics in painting technique and medium. This go round I attempted to paint with more volume and texture, adding a choppiness to the paintings by using extra heavy gloss gel to the acrylic paint to give the paintings a heavier and edgier feel, which increased (I think) the intensity of the paintings while at the same time decreasing the pain and stress to my hand in the creative process. 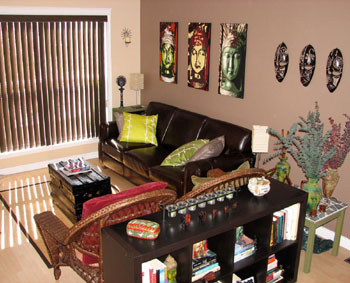 The swirls and designs in and around each Buddha head symbolize luminous wisdom. 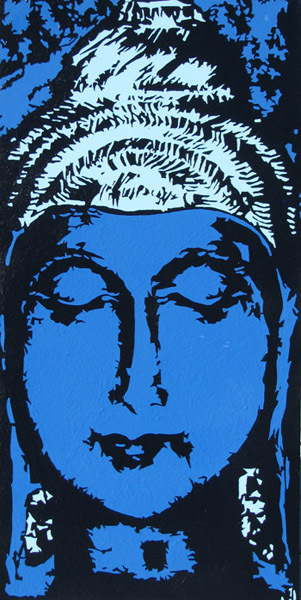 The Buddha is often depicted with an elongated topknot of hair to represent his enlightenment. 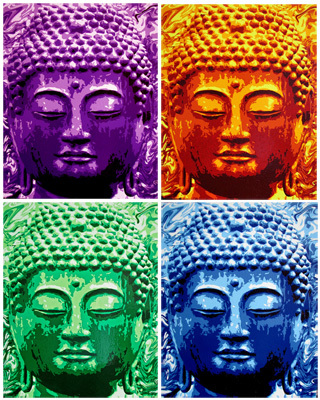 Here I have depicted supreme enlightenment as colours flowing and dissolving from the Buddha’s head into the suspended air of thought, emitting radiance and compassion in every direction. 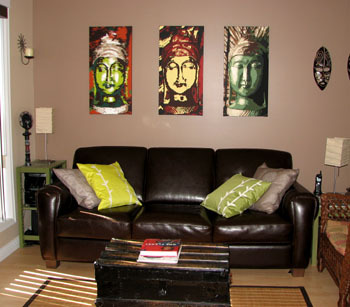 These 4 Buddhas went to Ralph and Daniella in Toronto. They are similar to the set of 4 I did for the All For Humanity fundraiser, however they have one extra colour level (5 colours instead of 4). The inspiration for this set of 4 paintings came from photos I took back in 2007 of the large bronze Buddha (cast in Tajima, Japan in 1790), that now resides in the Japanese Tea Garden in San Francisco’s Golden Gate Park. 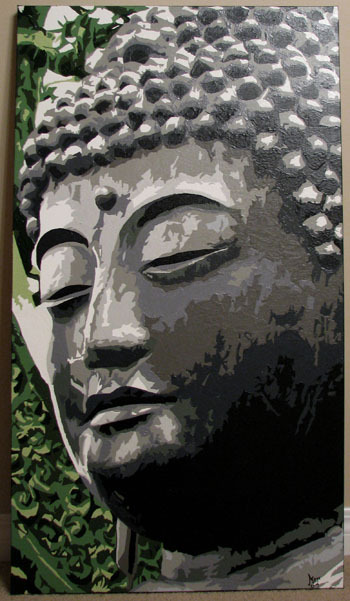 I have also used this same image of the Buddha for other paintings as well. Once again, these are done on one of my new favourite mediums, 16″x20″ birch boards. At first glance, they all look very similar, but each is slightly different in its own unique way (as we all are – not just to one another, but within our own psyche and the different sides of our personalities). Remember not to settle for the meaning of life, rather opt for the intense experience of it. Be trail blazers on the road of original experience. Savour the eternal memories that appear out of the fleeting moments. Travel undaunted amid the wonders and sorrows that will appear in the labyrinth of your journey together. And most importantly, experience the radiance of the world and your pairing with awakened hearts. Seek what you already are my friends – enjoy the journey. 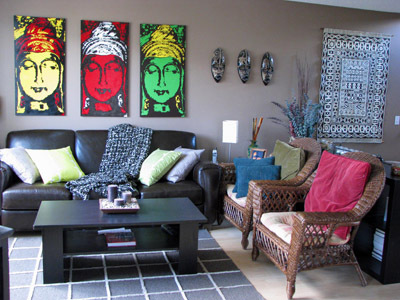 This set of 4 was painted for Rhonda’s All For Humanity charity fundraiser (silent auction) on June 19th, 2010. I have to admit, these paintings took more time from idea to completion than almost any other set of paintings I’ve ever done, particularly in the design stage. I spent more than 3 months getting the image just right. These are also painted on birch boards (16×20), not canvas as all my others are. The charity event was a resounding success and at the end of the night, Linda McCue who commissioned a painting by me back in 2006, won the highest bid on the set of 4 paintings. Congratulations Linda! This set of 3 was painted for Rhonda’s All For Humanity charity fundraiser. 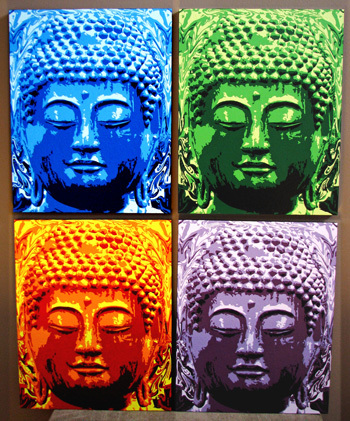 Not being happy with the original set of 3 Buddha’s I did back in 2006, I embarked on a second attempt in a more Andy Warhol-esque fashion. I wanted to take a bit of time off from painting this year and experiment with some other mediums. This is my first foray off untreated canvas into a new direction of treated canvas. I had no idea how challenging working with untreated canvas was until I started painting on this type of canvas.